It's been over a week since President Trump accused Barack Obama of wiretapping Trump Tower, and evidence backing the claim has yet to be shared. On Sunday, White House counselor Kellyanne Conway further clouded the situation. 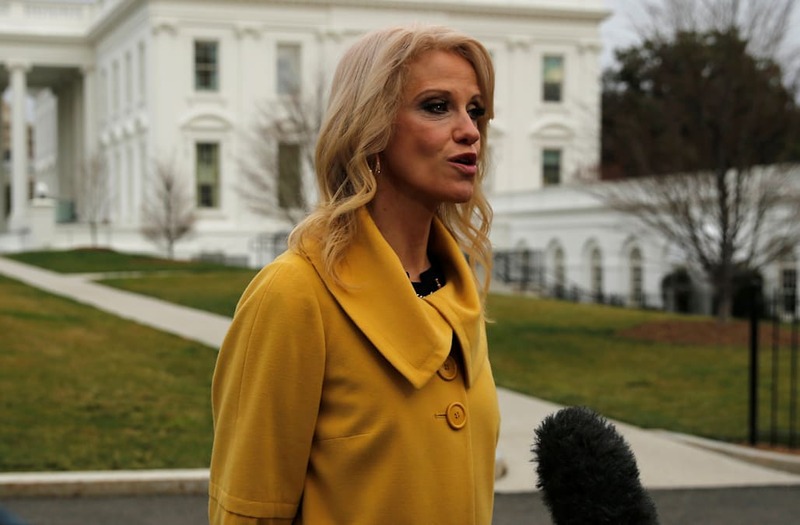 In an interview with 'The Record' of Bergen County, New Jersey, Conway implied that surveillance of the Trump campaign could have been broader than what the president indicated. She said, "...there are many ways to surveil each other...You can surveil someone through their phones, certainly through their television sets — any number of different ways." Conway further noted that clandestine watching can be done via, "microwaves that turn into cameras...we know that is just a fact of modern life." It is unclear where she got that information, but the recent WikiLeaks dump of CIA materials did reference such means, notes Politico. Conway has since stated she was not speaking of Trump Tower specifically, rather was commenting on surveillance in general. On Monday, she said on ABC's 'Good Morning America,' "I was making a comment about the articles from this past week where it is revealed that one can be surveilled in any number of techniques...I wasn't talking about anything specifically...I wasn't making a suggestion about Trump Tower. Those are two separate things." Regardless, the White House has yet to explain President Trump's March 4 tweets. They included, "Terrible! Just found out that Obama had my 'wires tapped' in Trump Tower just before the victory. Nothing found. This is McCarthyism!," and, "How low has President Obama gone to tapp my phones during the very sacred election process. This is Nixon/Watergate. Bad (or sick) guy!" Among those demanding an explanation is Senator John McCain. In a Sunday appearance on CNN's 'State of the Union,' McCain said, "I have no reason to believe that the charge is true, but I also believe that the President of the United States could clear this up in a minute. All he has to do is pick up the phone, call the director of the CIA, director of national intelligence and say, 'OK, what happened?'" Exterior view of the entrance to Trump Tower (at 721 Fifth Avenue), New York, New York, January 10, 2017. An interior view of Trump Tower, November 16, 2016 in New York City. Trump is in the process of choosing his presidential cabinet as he transitions from a candidate to the president-elect. The Trump Tower skyscraper on fifth avenue of Donald Trump property, the new president of the United States of America on January 31,2017 in New York. The structure is used both for offices and for residential apartments. People look from the windows of Trump Tower as protesters gather on November 9, 2016 in New York City. Throngs of demonstrators held marches across the United States on Wednesday to protest Republican Donald Trump's surprise victory in the U.S. presidential election. New York City Mayor Bill de Blasio speaks with the media after meeting with U.S. President-elect Donald Trump at Trump Tower in New York, U.S. November 16, 2016. The John Hancock building, left, and Trump Tower, right, stand in the cityscape as seen from the Willis Tower in Chicago, Illinois, U.S., on Wednesday, Feb. 13, 2013. Willis Tower, formerly named the Sears Tower, is the tallest building in the U.S. and one of the most popular tourist destinations in Chicago with over one million visitors to its observation deck each year. Exterior view of the 2011 Holiday Windows at the Trump Tower on December 2, 2011 in New York City. A New York City Police (NYPD) officer walks with a dog inside the lobby at Trump Tower, November 14, 2016 in New York City. Trump is in the process of choosing his presidential cabinet as he transitions from a candidate to the president-elect. Interior view of escalators in Trump Tower (at 721 Fifth Avenue), New York, New York, January 10, 2017. American businessman Donald Trump in his office in Trump Tower, Fifth Avenue, New York, 1999.
circa 1980: Shops and shoppers inside Trump Tower in New York City. Tourists walk through Trump Tower on December 16, 2016 in New York City. Since President-Elect Donald Trump's win, thousands of Trump fans, tourists and the simply curious have converged inside Trump Tower. Trump continues to hold meetings with potential members of his cabinet and others at his midtown office. Trump Tower skyscraper at 5th Avenue and 56th Street on August 24th, 2013 in New York City. An image of Republican presidential nominee Donald Trump hangs inside a freight elevator at Trump Tower in Manhattan, New York, U.S., October 7, 2016.